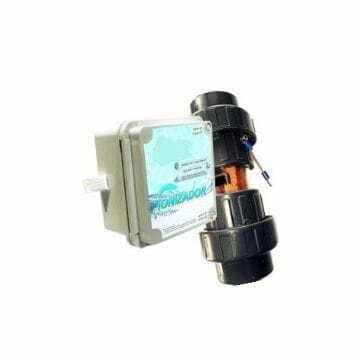 Ionizers for the disinfection of pool water, practically without the need to use chlorine or other similar disinfectants. Wide range of accessories for cleaning, maintenance and construction of swimming pools. Laminated sand filters with ultraviolet protection for the use of it under the sun rays. 6-way valve in ABS. Filters in high density polyethylene with UV protection for its use in the sun. 6-way multi port valve in ABS. Centrifugal pumps not self-suctioning for operation in swimming pools with positive suction. Single stage self primming centrifugal pumps designed for recirculation of water in in-ground swimming pools, with thermal protection and detachable prefilter. Centrifugal single stage self-priming centrifugal pumps designed for the recirculation of water in in-ground pools with built-in frequency inverter. Self-priming single stage centrifugal pumps designed for recirculating water in in-ground pools, with built-in thermal protection and removable pre-filter. Heat pumps to heat the pool water by means of an internal exchanger, with a high performance Titanium coil.